And for the Blues there is a fresh look to their structure off the pitch. Brett Sturgess has been elevated to the head coach role while Jamie Elliott – recently released by Northampton Saints and about to start a Championship season with Bedford Blues – has been appointed as backs coach. It offers to bring a fresh approach as they bid to shed the role of nearly men and make their way out of the division. “Brett came in as a player and a coach so it is just a case of him stepping up,” director of rugby Doug Bridgeman explained. “I’ll be less involved in the direct coaching side. “I’ve been trying to take more of a back seat for the last couple of seasons to make way for others coming through. “We’re constantly looking to move things forward and bringing fresh blood and fresh ideas in has to be part of it. “You have to move things on and Jamie coming in as backs coach is a part of that. “He’s obviously left Saints and gone to Bedford Blues. He is still very much intent on progressing himself as a professional rugby player. “But he is also keen to get involved in coaching with the future in mind. “He will come in and bring a bit of fresh air with him. “He’s a young player still –the same age bracket as a lot of our players – so the link will be there but he’s also extremely experienced. “He will coach during the week and, as Bedford have quite a few Friday and Sunday matches, he’ll be with us on a Saturday when he’s available. “We’ll provide him with videos of the games so he will not be coming in blind even if he hasn’t been at the match. “I’ve had chats with him for a while and he was one of the people we wanted to speak to because his philosophy about the way the game should be played is the same as ours. “We don’t want someone to come in who will start trying to make us play 10-man rugby. As for the potential for promotion, Bridgeman believes his side have every chance of challenging. “I’m pretty sure we’ll be up there,” he said. “I’d be very surprised if we’re not very competitive this year. “I’d like to think we’ll be difficult to beat but it comes down to the odd game here or there. “There were two games that we lost last year that cost us – one was by a point and one was by three points. That’s how close it is. “It won’t be any easier this year. “I would expect Towcestrians (who were relegated from London & South East Premier last season) to be strong. They have played at the higher level and have that experience. “Every time I look at the website for West Bridgford - who we play on Saturday - they have made two or three signings. “It doesn’t look like they are planning on coming up and consolidating. But how do the Blues go that step further? The last four seasons have brought them two fourth-place, a third and a second-place finish. Now they need to do something different to finally break the cycle and go up. “We certainly don’t want to be more pragmatic in our approach,” Bridgeman stated. “I think it is a case of learning through experience. 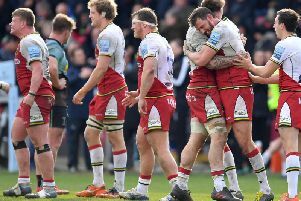 “After Bournville beat us in the play-off a couple of years ago, one of their coaches told me it had taken them five seasons to get out of it. West Bridgford is the venue for Kettering's start this weekend. The Nottingham-based side were Midlands Two East (North) champions last season, winning 18 of their 20 matches. Wellingborough and Oundle also kick off their campaigns this weekend with home games against Leighton Buzzard and Old Northamptonians respectively.